If you’re deliberately looking for South Brooklyn Pizza in the East Village, you might miss it. 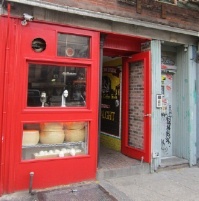 Nestled in along 1st Avenue near St. Mark’s Place, you could easily walk by the bright red door and never realize you just passed a restaurant serving carefully made pies to the lucky customers who do spot its unassuming entrance (no sign here). However, if you see huge wheels of cheese in the window and smell the wafting scent of garlic or pepperoni coming from the tiny space, you’ll know you’ve come to the right place. Just one of the several outlets for this Brooklyn-based pizza shop, the East Village location is only one of countless options for a slice in the neighborhood, but luckily for SBP—and even more luckily for you—there’s a reason the only choices here are whether you’d like a slice or a whole pie, and which toppings you want if you choose the latter. When the pizza is this tasty, there’s no need to clutter the menu with other offerings. You will definitely pay a higher price for your margherita slice at SBP ($4), which will be taken from the pie on display that is fresh out of the oven, and you’ll have to wait if the person in front of you gets the last slice. And you may not consider $25 for a full pie, before adding any toppings, a bargain (although you will appreciate the no-fuss topping choice—they don’t bother messing around with such concoctions as ziti pizza or salad pizza at this establishment). However, once you get your meal home (the space is cozy at best and cramped during regular meal time, so it’s not designed for hanging out), you’ll understand why you just paid a premium. This pizza isn’t your average pie. You may not know why at first, although you may have guessed from the premises that the ingredients are fresh and the creation process is authentic. All you’ll know is that the three cheeses, sauce, and delightfully textured dough on your slice of sustenance somehow combine to form the perfect bite. But that’s fine, because that’s enough to keep you coming back to South Brooklyn Pizza. And next time, you’ll know exactly where to find it. Just look for the cheese wheels—and if all else fails, follow your nose.